In the Andes of Peru there are ancient sacred sites and places of immense power, where the land, the mountains, and waters are alive with archetypal energies that spiritually activate us. In these awakened elevations we find the axis mundi, where Heaven and Earth unite. our own "axis mundi", that will empower us to navigate the chaos in the world around us, and to restore the sacred relationship of reciprocity with the Pachamama, our Mother Earth... and with all beings. On this quest we will be using special sacred sites as our activating coordinates, while working deeply with the symbology of the Incan Cross, called the "Chakana" in Peruvian spiritual cosmology; as a compass to guide us in unlocking the Chakana's mysteries and spiritual codes, in order to find the "Noccan Kani", the "I AM", within its center. It is through this portal that we can experience our Divinity and Oneness . Pat Cockrell and Petra LeBeau ...as they travel with paqo Don Alberto Fernandez Santa Cruz, and other Peruvian Wisdom-Keepers, the male and female shamans called "paqos", who are the healer-priests of the Andes, to many of Peru's most powerful sacred sites. 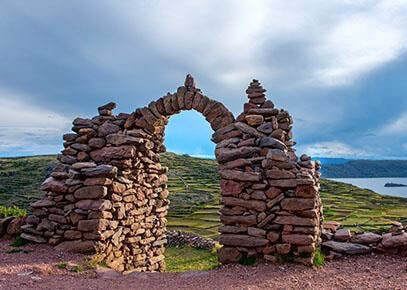 We will also travel and learn from Silvia Calisaya Chuquimia, an amazing healer and spiritual teacher located in the Lake Titicaca area and learn more about the Aymara pre-Incan culture in that region. Come experience the potent spiritual activation that Peru evokes — as you participate in ancient ceremonies, rites, and rituals, at these special places of power and healing! Tour cost is based on double occupancy. Includes hotels, private bus and ground transportation, entrance fees to sacred sites, tour guides, spiritual paqos, ceremonies, porters, cooks, all breakfasts, and picnic lunches when in the field (as mentioned in itinerary). Price does not include flights, or optional trip to Machu Picchu. 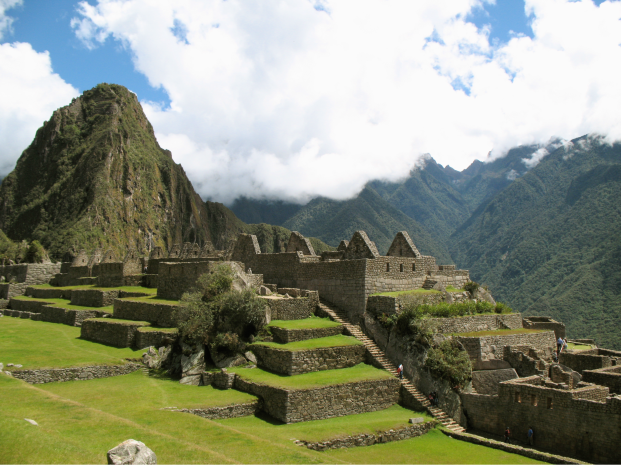 As owner of Sacred Quests LLC, Pat has taken many people on sacred journeys throughout Peru. 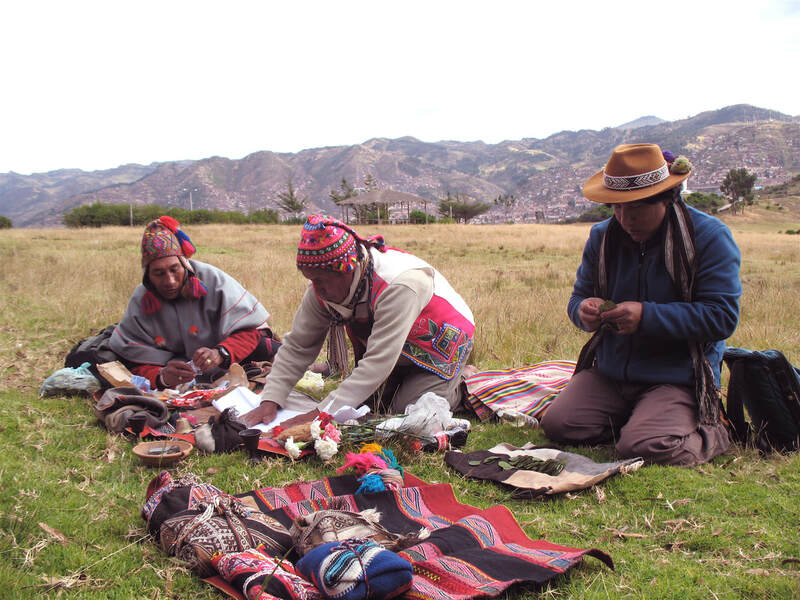 Pat has studied and traveled extensively with the medicine people of Peru, and has been initiated by these wisdom-keepers, the paqos of the Andes. She has journeyed with them to many of their sacred sites, participating in ceremonies, initiations, and rituals. Pat has a private practice in North Carolina as a shamanic practitioner; using many forms of ancient healing techniques with her clients. She also mentors, and teaches workshops throughout the USA. Pat also received her training in Shamanic Energy Medicine from Dr. Alberto Villoldo's Healing The Light Body School of the Four Winds Society, and has completed their Masters of Healing program. Petra is a biomedical scientist as well as a shamanic practitioner with over a decade of experience in ancient and modern forms of energy healing. Petra is a graduate of the Four Winds Society's Healing the Light Body School and has studied often with indigenous medicine men and women from the Q'ero lineage of the High Andes in Peru. Petra has a small private practice in North Carolina and offers workshops in the shamanic healing arts. It is Petra’s passion to assist people on their journeys to wholeness. Whereas Petra focusses on statistical probabilities in her scientific job, in her healing practice she focusses on possibilities; using a plethora of techniques, Petra guides an individual towards expanding their individual map by releasing energies that are no longer needed, so new possibilities for healing, balance and growth can be attained. We will be waiting for you with open arms at the airport as you arrive in the city of Cusco, known as the navel of the Incan Empire. From Cusco you will be taken in our private tour bus to the village of Pisac, where the lower elevation makes it easier to acclimate. Here, we will help you get settled into our beautiful hotel, The Royal Inka, to rest after your travels. Our focus on day two is to begin to get our bearings and set clear intentions for our spiritual quest; for both our personal journey, and our experience as a group. Our individual complementary coca leaf readings with the Paqos will help us set our inner compass and refine these intentions. Then, traveling a short distance from Pisac to the Temple of the Falcon high above the village overlooking the Sacred Valley, we will call upon the Pachamama and the Spirits of the Andes, as we participate in a despacho ceremony - offering our gratitude and asking for guidance and blessings upon our journey. Here, we will begin our spiritual orientation to the deeper meanings of the Chakana. Transport by bus to the sacred site high above the valley floor of Pisac – the Temple of the Falcon (about 20 mins). 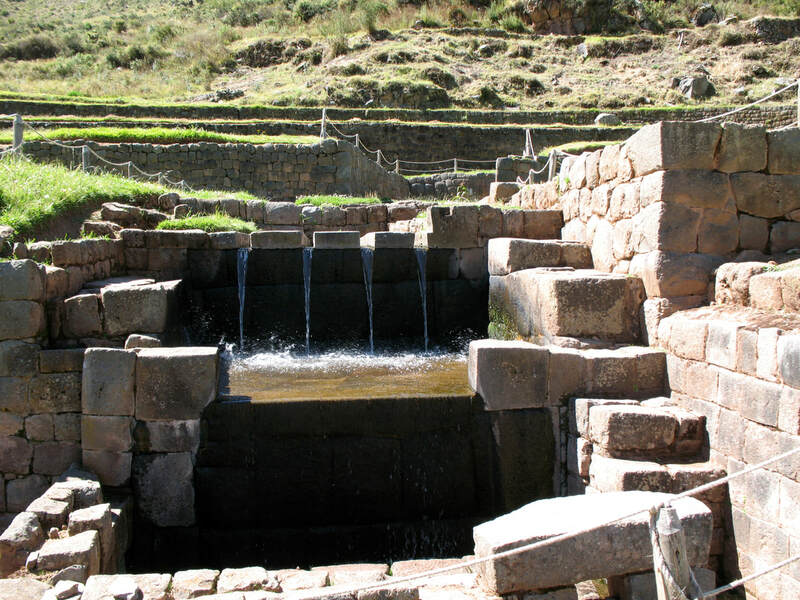 These impressive ruins are considered one of the finest remaining Inca archeologic sites in the country. 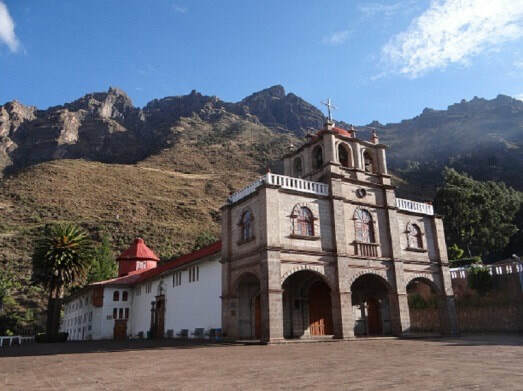 The site also offers stunning vistas of the Sacred Valley and the Urubamba river. Opening despacho ceremony at the ruins to offer gratitude for our blessings to Mother Earth (Pachamama) and the mountain spirits (Apus) and to set our intentions for the journey. ​At these two places of power we will begin to prepare ourselves, with the help of the Paqos, to clear away the worldly dross so we may enter into the inner state of “Noccan Kani”, the sacred place of “I am”, and find our inner balance point - represented by the hole in the center of the Chakana. We will work with the elemental spirits of water, and the spirit of the mountain, Apu Pachatusan, in these sacred places. Upon the powerful site of the ancient celestial altar of Pachatuscan a chapel was built by the Spanish. It is said that the Christ appeared to a native Peruvian here, and so it is called Lord of Huanca. This day we will visit and work with the sacred mountain Apu Pachatusan, a Quechua word meaning “one that sustains the Earth”. This mountain is also known to be the Axis Mundi or Tree of Life. In the morning, we travel by bus (~1 hr) to the ancient site of Tipon, the Temple of the Waters which was built by the Inca Pachacutec. These ancient archeological ruins consist of an ancient temple, baths, canals, and aqueducts where the water still flows today. We will work with the Paqos to deeply cleanse and balance ourselves. The ancient Peruvians had a profound relationship and connection to the stars and the Pachamama, our mother Earth. Here, at these two sacred sites we will have the opportunity to experience the activation and reawakening of the ancient memory of this connection held wthin our DNA, which the living energy of these places stirs within us. At the ancient solar observatory of Urco, we see the symbol of the Chakana in the stonework and experience the energetic significance of its precise location here, where important ley lines converge. 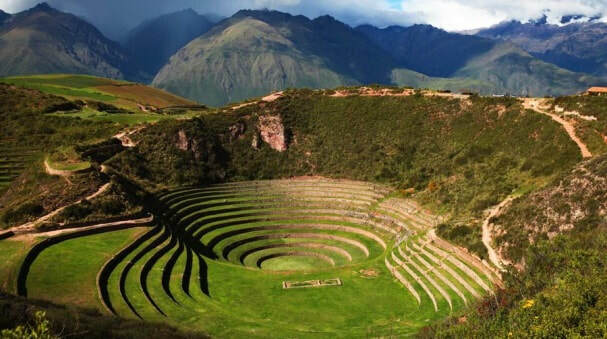 Then, traveling further into the Sacred Valley, we visit the Earth Temple of Moray, and through ritual ceremony with our Paqos, we will plant the seeds of our becoming in this fertile feminine womb space. Travel by bus to the Inkariy museum (~40 min). The museum offers a beautiful and interesting journey through time and shows Peru’s richness in history and traditions by its many ancestral cultures. We will visit thes acred site of Urco. The site contains a beautiful circular building that served as a solar observatory with windows marking the winter solstice. We will also visit the huaca (powerful energetic place) in the shape of a frog and a fountain carved in the shape of a snake. Glacial waters used to be channeled from the high Andes behind this temple. Continue by bus to the ancient Feminine site of Moray (~1 hr), where the Inca’s built vast stone terraces carved into a deep bowl shape in the earth. Here the Incas planted their sacred corn and experimented with different crops in the fertile soil of Pachamama (Mother Earth). if you are coming to Peru for the first time, Machu Picchu is a must-see! Words cannot describe it… it is a magical and otherworldly place, called one of the Seven Wonders of the World. It is believed that there still exists a thriving city there on the spiritual plane, and one can feel the presence of its multi-dimensional energies. For those who may have been to Machu Picchu before, this provides a free day to relax and explore the area on your own. 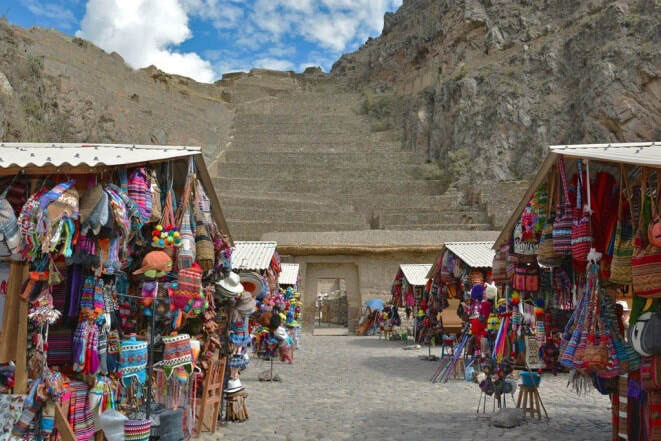 A day to rest and relax, explore the authentic Incan town of Ollantaytambo, its magnificent local sacred sites, and shop at the market/local shops near the ruins. *Optional trip to Machu Picchu – additional cost $325.00. Includes round trip train fare, entrance fee and guided tour. Reservations for this day trip must be made by March 15th and full amount paid for, as Peru is now limiting the amount of people allowed daily into Machu Picchu. When we were first conceiving this sacred tour we consulted the coca leaves with don Alberto to ask which Apu we should specifically travel to and work with, and it was Apu Wakaywillka that called us to come to her. Named the mountain of “Sacred Tears," this beautiful mountain has a way of opening and softening the heart, and washing away the veils so we can see through the eyes of our heart. “Munay," or universal love, is central to Peruvian spirituality and practices, and it is through the heart that we experience our interconnectedness with all things. As we camp under the protective embrace of Apu Wakaywillka, we will be led by the Paqos in practices, rituals, and ceremonies designed to open the heart center. At night we can look up to see the Milky Way like a huge river of stars stretching across the sky. It is where these mountains rise up that heaven and earth come together, and we can experience the Axis Mundi. Short bus ride (~45 mins) to the base of Mt Veronica also known as Apu Wakaywilka (mountain of Sacred Tears). We will hike to our base camp for about 1 hour through beautiful, gently sloping landscapes with a gorgeous view of the mountain as well as Apu Salkantay. It is said that Wakaywillka communicates to Salkantay through thunder. We will visit the beautiful waterfalls at the base of the mountain. We will work with the powerful feminine energy here, and explore our connection to the elementals and water spirits. Our time on the mountain ends with a special ceremony and an energetic transmission from the Apu Wakaywillka given to us by the Paqos. Relax at the hotel and/or explore the ruins/town. Travel ~7-8 hours by private bus to Puno, Peru, the main port town on the shores of Lake Titicaca. We will be spending two days here connecting deeply to the energy of the Lake Titicaca. As you will gather from reading below, this is a very important destination on our journey. Here we will work with Aymaru healer and teacher, Silvia Calisaya Chuquimia. Much legend and lore surrounds this mystical Lake. 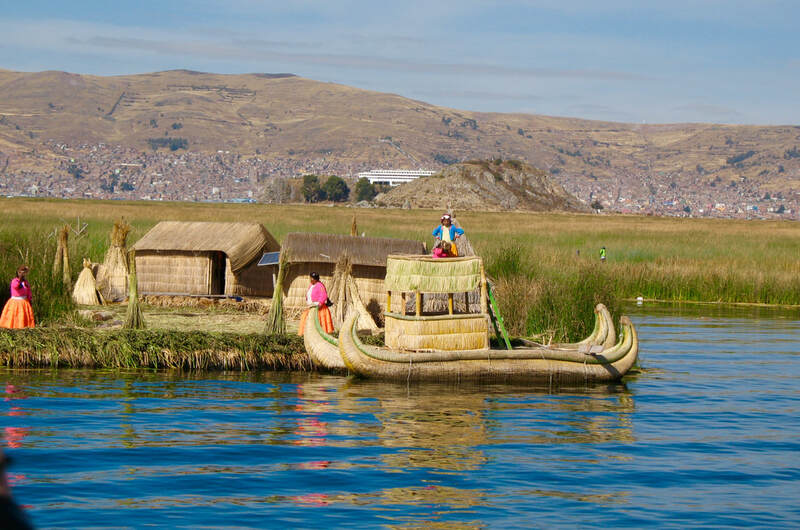 In Andean mythology Lake Titicaca is the birth place of the Incas, where the gods Mallku Kapac and Mama Ocllo emerged from the lake to start the Inca Empire. Legend also has it that the remains of the Lemurian civilization lie at the bottom of Lake Titicaca, and at the time Lemuria was sinking, one of the seven Great Masters of Lemuria, Lord Aramu Muru, was given the mission to bring the sacred Golden Solar Disc from the Temple of Illumination to Lake Titicaca for safe keeping. During the time of the Incas, the Solar Disc was transferred to Cusco, and placed in the Qorikancha, the main Temple of the Sun, where it stayed until the coming of the Spanish. At that time, it was returned to Lake Titicaca and placed in the Eternal Etheric City deep inside the Lake. The golden disk is reputed to contain great cosmic wisdom, much as a galatic computer, which now in our times is being re-activated. There are many sightings in the area of UFOs and bright lights going in and out of the lake. This special lake contains the crossroads of two of the earth’s greatest ley lines, and it is considered to be the sacral chakra of our planet - holding the womb space for the earth. The healing waters of Lake Titicaca are considered sacred, and it is a living well of water sourcing deep from within the earth. A morning hike to the top of Amanatani takes us to the Pachamama and Papapapa Temples where we will work with balancing the masculine and feminine energies. From here we will energetically connect to the Island of the Sun and Island of the Moon. Our time on the lake and this lovely island ends with a special ceremony and an energetic transmission from Lake Titicaca given to us by the Paqos. Hike to the top of Amantani Island to the Pachamama and Pachapapa temples.. 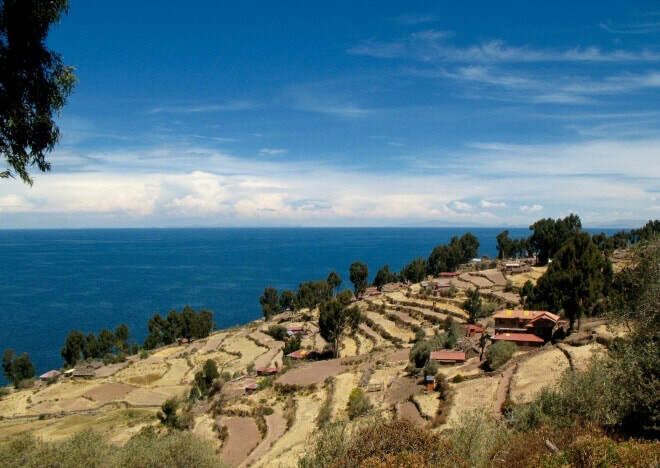 Enjoy the stunning views over lake Titicaca, Mama Cocha, from this high elevation. Afternoon ceremony working with the masculine and feminine energies. We will also connect with the Island of the Sun and Moon. Enjoy the beautiful sunset or hike back earlier to relax at the lodge or explore the surroundings on your own. After dinner, we will attend a demonstration of ceremonies from this region offered by the village families. Much of our journey culminates here at Amaru Muru. 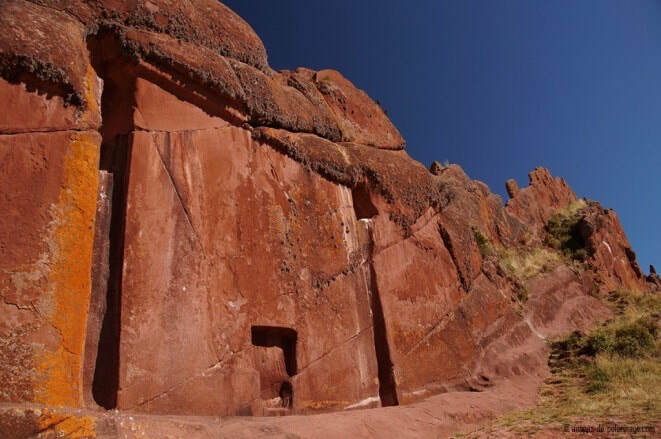 Known as a Stargate, or Gate of the Gods, it is considered a multi-dimensional doorway, or portal, through which the renowned high priest, Lord Amaru Muru, entered and was never seen again after hiding the The Golden Solar Disc from the Spanish in the depths of Lake Titicaca. The natives say that many great spiritual heroes have passed through this doorway into the land of the gods. We will do a rite of passage ceremony here using the energy of this amazing sacred site to symbolically go through the “eye of the needle” - releasing all those things that no longer serve us, in order to enter the Noccan Kani - the infinite time and space within the “I am” represented by center of the Chakana, to birth a new becoming. We will have a ceremony at this amazing energy portal and a “rite of passage” into our new becoming. A day of relaxation and integration as we take the tour bus ride back to Cusco. 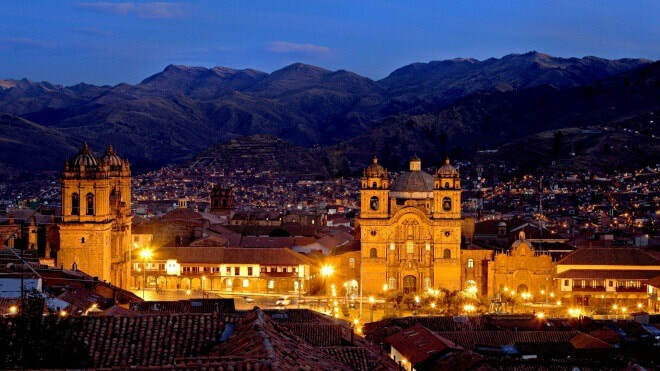 ​At night we will have a celebration dinner provided by our tour hosts, at one of Cusco’s fine restaurants. Our final morning in Peru and time for goodbyes! 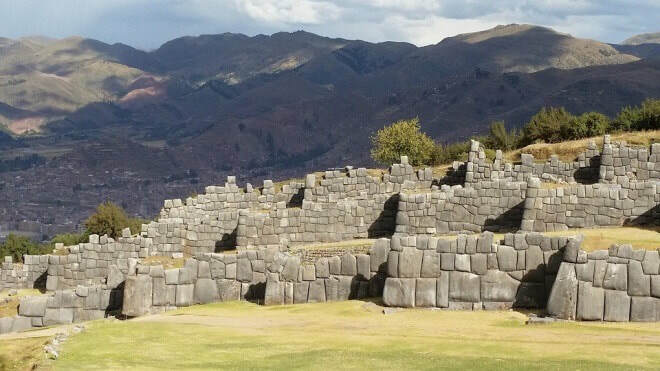 For those taking later flights home, there will be a late morning tour of Sacsayhuaman, the ruins of the ancient fortress on the outskirts of Cusco.